Umbrella Scheme for Education of ST Children -Post Matric Scholarship (PMS) for ST Students Arunachal Pradesh for the year 2018-19. ** The State Government/UT Administration selects certain schools in different Districts/towns with hostel facilities which show excellence in performance of students from class IX to XII. ** The Ministry fixes the total number of awards for each State annually. ** Coaching starts from class IX in the identified schools and continues till the awardees complete class XII. ** Coaching is provided in languages, science, mathematics as well as special coaching for admission to professional courses like engineering and medicine. ** While selecting the ST students the aim is to include at least 30% girl students and 3% disabled students. ** The scheme provides for 100% central assistance to the States/UT’s. ** Scholarships are paid to students whose parents’/guardians’ income from all sources does not exceed Rs. 2.50 lakh per annum. ** The scholarships are available for the study of all recognized post matriculation or post- secondary courses in recognized institutions except certain identified training courses like Aircraft Maintenance Engineer’s Courses, Private Pilot Licence courses etc. ** Students who have received coaching in any of the pre-examination training centres with financial assistance from the Government will not be eligible. ** Rs. 8,000/- per year per student for honorarium to Principal, Experts and other incidental charges. 2. Besides the amount of scholarship, students with disabilities are also eligible for the additional grants provided in the Scheme. 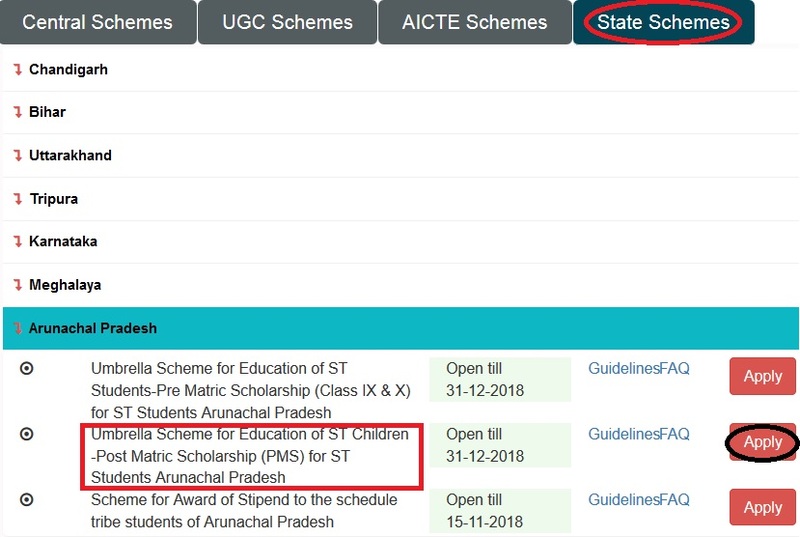 Last date to complete the online application for Umbrella Scheme for Education Post-Matric Scholarship For ST Students Arunachal Pradesh 2018-19 is December 31, 2018. Last year my daughter got only rupees 2000 but her friends were got 19,500 rupees. How this difference occurred, still I am puzzled. I want to know that whether I am selected for this scholarship (or) not. My brother’s school verification has not done still so, please extend the date for few days. I am unable to verify the students. The website for Umbrella Scholarship is down for maintenance. When will it be opened? Really stressed. I have not registered yet. My NSP registration has not been verified by my institution but some of my friends registrations have got verified successfully. Is there any solution? Please help. I have done my registration successfully but it can’t be verified through my institution. The administration department of my institution told me that its not their fault then whom should I blame now because I have submitted all the necessary documents correctly, & even I had received the confirmation SMS as well as pages while registering. So if anyone have any idea, please do share. I am not able to find my result. What can I do to get it? Kindly assist me. I mistakenly applied for Tribal Affairs Scholarship, what shall I do now?